February is too early in the year to get into a funk, right? My last lesson was in mid-January. Before that, my latest lesson was in the beginning of December. I used to be committed, going once a week, every week. If I had to pin down a point in time when that stopped, I would say it was around the time that Ryon’s jumping started feeling off. We later diagnosed it as osteoarthritis and stopped jumping with him and since then, I’ve never regularly picked it back up again. Even when we brought Maeby home last winter and then she got sick and then she pretended to be lame, we never hit a consistent stride with lessons. Work got extremely busy this fall and winter and now here we are in 2018. I’ve been lucky in that I’ve also been able to build flexibility into my training program for those random weeks when I’m out of the country or have to work late. Unfortunately, this means that progress isn’t in a straight line, which I believe is one of the most common gripes of being an adult rider. That and paying for everything by yourself. It’s easy to get frustrated when I put in A effort and don’t get B result. It’s even more frustrating when it’s supposed to be for something you’re doing for fun. When I compare horseback riding to other physical activity related hobbies I’ve had, it’s easy to get bogged down in the amount of negative energy I have toward it. With running or power yoga, progress was much more linear and effort was rewarded directly. The horse is the X factor in riding / the horse is the best part about riding. To be honest, I’ve been one of those riders who has seesawed back in enthusiasm about lessons and training rides. I also tend to plummet into an anxiety spiral re lessons. I overthink the lesson even before I get to the barn. To be clear, there is no external pressure that’s being exerted on me. I have zero shows or clinics on the calendar; that’s never been the point of my riding. The only person who beats themselves up is myself and the only person with higher expectations than my trainer is also myself. I wouldn’t call myself a perfectionist, however, I do expect myself to try harder and work harder at every single thing that I do. Notice that “having fun” doesn’t have a place among those expectations? And maybe that is where a shift is required. Is it possible that the goal should be to have more fun and take things less seriously? I’m starting to think - as I’m closer to my mid-30s than not - that it’s time to make a shift in thinking here. There should be less teeth-gritting and more laughing. I’d love to hear from you all to hear how you’ve wrestled yourself out of anxiety with your horse or how you changed up your ride to keep it as something you enjoy. 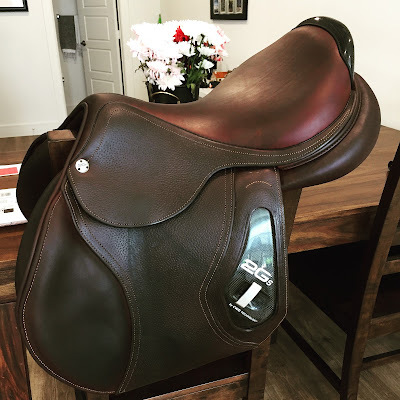 On a lighter and more fun and exciting note, I’ve been talking about getting a new saddle for ages now and last week finally ordered a new-to-me 2015 CWD 2Gs saddle (eeeep) from Redwood Tack. About five years ago, I bought my trainer’s Amerigo Pinerolo jump saddle from her. This past winter, she said that I’ve outgrown it - which I’m not sure what that means as I stopped growing over 10 years ago. The new saddle arrived on Saturday and I immediately went out to the barn to try it out. Luckily it fits Mae and me (let me know if you have questions about the specs). It is AMAZING and I love it. The semi-deep seat is different than what I have with the Amerigo and I feel a lot more consistent contact through my seat and my entire leg. We jumped with it a few times on Sunday, and it put me over the fence and allowed me to ride the back side of the fence in a way I haven’t been able to before - sitting up and able to use my body as leverage in holding my hands up. I actually can’t wait to jump with it more. But that's a fabulous new saddle, sounds like it's gonna make a big difference in your riding! The struggle is definitely real. I think it helps if you have an atmosphere you absolutely love, like I loved my old trainer she was family and a lot of the people at my barn were family as well. It made coming and hanging out at the barn even when I wasn't riding very easy and fun. Also having a horse I was absolutely head over heels for (Carlos) made things fun too. The fun/enjoyment aspect ended up fueling my desire to be further committed and work harder because I wanted to make all those people and my horse proud of me. I don't even ride but I think that saddle is beautiful, Rooth:) And I totally understand how you're feeling even though I don't ride as I've said. It's actually harder to overcome pressure we put on ourselves than the external ones. I guess the only thing I can say which has worked for me is to just focus on the moment itself and not to overthink, which I know is easier said than done! The new saddle is a beauty! The goal should be to have more fun. But it's difficult to get that jerk who lives inside my head to understand that. You get used to living with self-induced stress and it becomes a way of life. I'm going to start with trying to wean off the stress and then work on "fun". February is usually when I get in a funk -- I'm tired of winter and ready to ride outside, but I still have a little while until spring comes. I get anxious about lessons sometimes, but I find that the more I DO IT, the less anxious I am. I also try to ask myself what I'm specifically anxious about, and usually there's not a clear answer so I tell myself to stop worrying. I'm also able to be 100% honest with my trainer, so that helps too -- I know if I tell her I'm worried about something she asks me to do, she will either let me skip it, do a different variation, or give me extra help.